Nothing says summertime to me like watermelon. Honestly though, I will eat watermelon in the dead of winter, if it's available to me. Once, on a cruise I actually LOST weight because the buffet had watermelon, in all its sweet, juicy glory, 24-7. 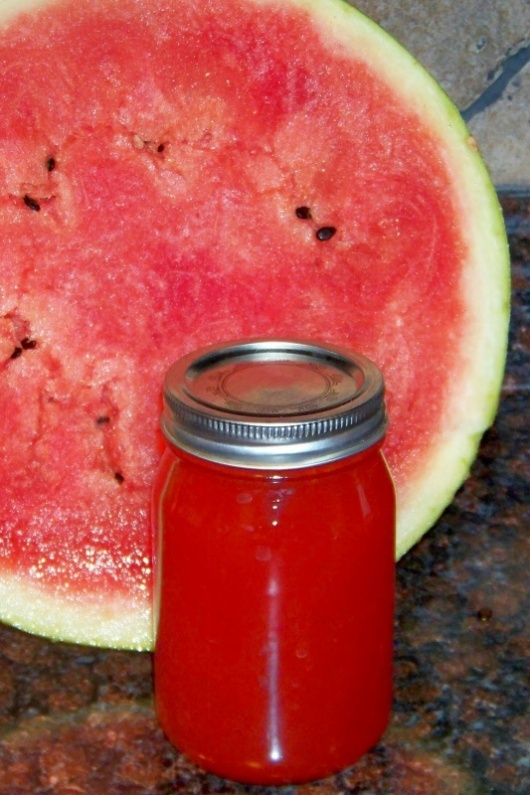 Getting creative a few years ago, I saw a watermelon rind pickles at a local street festival, and I thought why can't I make watermelon jam? I got to work, and though it seemed to take a lot of watermelon, the results were amazing! I have since lost the directions I wrote to myself, but have deduced what I think to be a similar method and ingredient list through comparing other jam recipes and adapting. I think you will be impressed and be able to have watermelon (in flavor at least) all year long! My result was a very beautiful pink jelly, with a deep watermelon taste, and sweet with a little bit of tang. Combine watermelon puree, sugar and lemon juice in a large, non-reactive pot. Bring to a boil and let it boil vigorously until the temperature of mixture reaches 220 degrees F.
Add the powdered pectin and boil for an additional five minutes. Remove from the heat and pour into clean, sterilized jars. Wipe rims, apply lids and screw on bands. Process in a boiling water bath for 10 minutes. After ten minutes, remove from canner and let jars cool completely. When the jars are cool enough to handle, test seals. Store in a cool, dark place for up to one year. My watermelon jam was great on toasted English muffins, and I even had some PBJ sandwiches with it. I think I am going to have to make up some more this summer!